Hide 27 comments... Click to show. The contest winners should be announced soon once everything has been verified and checked - since the server is back to normal. Thanks good luck to you to. To add on onto what Exerath said, even if Guardians were allowed to give FanBucks we wouldnt just give them away. If you want FanBucks you have to earn them. Please DO NOT spam in order to grant personal advantage on Fanup since its against the rules. Thanks for your attention. Simply upload your video under the Video tab on the contest page. Please do not spam your video link on all FanUp members profile page, Thanks! Welcome to Fanup!!! You can earn your favorite game currencies for free by converting the fanbucks you earn into the specified currency you like!!! Here are the links for how to earn Fanbucks: http://www.fanup.com/weekly-leaderboard-contest, http://www.fanup.com/efangelist, http://fanup.com/fanup-offerwalls etc. You can also download the Fanup toolbar and do related searches that will earn you Fanbucks here:http://www.fanup.com/toolbar#. Check out the recently held contests here:http://www.fanup.com/contest so you can earn a ton more Fanbucks, easy and fast. You can ask me anything you want to know about Fanup or even the guardians. Also hope you can like this page and help out a bit;http://ow.ly/9ZKdp. Thanks and have fun on Fanup! You can either create an Avatar or upload your own via profile. You have to resize (if you use your own image) so it fits on your profile. Welcome to the FanUp Community! Learn more about FanCoins & FanBucks here! Like Gamerz mentioned, I use photoshop and I only did it cause the Avatar thing was bugged but I've been told it's fixed now. Simple, Just search the game from the search bar OR select from the tab below search bar. Then visit the game page and Fanit-up. Then click on guides and make it. Be sure to make it good :). Before every saturday, Guide Moderator - Splooshi will check it and give FanCoins based on its quality ! To post custom Avatar - go to profile->and upload it ! welcome to fanup mate, btw nice pic but too wide, change it!!! if you have questions or concerns about something, feel free to ask any of the Guardians they will help you. 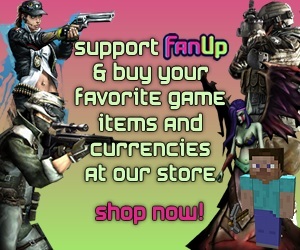 Then use the toolbar to SEARCH & SHOP shop online at your favorite stores like REI, Bed Bath & Beyond and Best Buy to earn more FREE FanBucks to buy your favorite in-game currency like G Coin, Z8 Points, G1 Credits, Facebook Credits, iTunes Cards and anything else on the FanUp Marketplace! It's quick and easy to install and the toolbar works on the most popular browsers...Firefox and Internet Explorer so it's convenient for you. please make sure you have created a fanup account and are using the latest versions of firefox or internet explorer to dowload and install the toolbar! Remember FanUp is also on facebook! just click on I like and keep track of everything that happens in this great community. Hey do not forget to participate in all events. participate and win fabulous prizes. hey!! i m new to this site, ny 1 help please!!! btw i cant create my avatar?